I'm finally back home from a long trip visiting family, so it's time for me to get back in the swing of things by checking up on the current activities of the twenty spacecraft exploring the solar system. I'm going to change things up this week and lead with the two active ESA-led missions, Mars Express and Venus Express, both of which announced new activities last week. Both spacecraft are little sisters to Rosetta, re-using many components of the design and instruments of their much larger (and more expensive) sibling. I just covered Mars Express' current Phobos encounter campaign in the previous post; it will fly within 97 kilometers of Phobos tomorrow, July 23. Venus Express is also shifting its orbit. It has been at Venus since April 11, 2006, and is now coming to the end of its nominal mission. Frequently, when spacecraft have successfully completed their intended missions, mission managers are willing to relax some constraints on the spacecraft that were intended to prolong the spacecraft's long-term health, in order to provide new opportunities for valuable science or engineering data. For Venus Express, this means that the spacecraft is being commanded to change the shape of its orbit in such a way that it will begin to feel pressure from Venus' atmosphere at its closest approach. To date, its highly elliptical orbit has had a closest approach altitude (periapsis) of between 250 and 400 kilometers, over the north pole, and a distant apoapsis of about 66,000 kilometers. The orbit will now be lowered to a periapses of between 185 and 300 kilometers. To do this, they also have to raise the altitude of the apoapsis enough to keep Venus Express' orbital period constant. This has nothing to do with orbital mechanics or science: one way that the Venus Express mission manages to keep costs low is to have Venus Express' orbital period exactly match an Earth 24-hour day, so that Venus Express always communicates with ESA's own radio dish at Cerberos in Spain, so the new orbit must also have a 24-hour period in phase with Earth's rotation. Lowering the altitude will facilitate newly detailed investigations of the north polar magnetic field, in-situ investigations of the ionosphere, and measurements of the density of the upper atmosphere through the determination of the drag experienced by the spacecraft as it dips. If this phase goes well, the ESA statement indicates that the next phase of the mission will involve a test of aerobraking at Venus. Venus Express wouldn't be the first spacecraft to do this at Venus -- Magellan has that distinction -- but it will be important experience for ESA mission controllers. Aerobraking at Venus is tougher than at Mars because Venus' atmosphere is denser, its gravity higher, and it's much closer to the Sun, so very fine control is necessary to keep the spacecraft from overheating. At the Moon, Chang'e 1 and Kaguya are currently in orbit. Last week the Kaguya team released an incredible movie, a flyover of the relatively fresh Tycho crater on the Moon. Here's a direct link to the full-size movie (which is just a bit under 300 MB, not for low-speed connections!) and a pointer to what Chuck Wood has to say about the view. Also on the Kaguya image gallery is a nifty view of the Apollo 17 landing site created from Terrain Camera data (below). And unmannedspaceflight.com visitor "nop" pointed out that there are papercraft kits of Kaguya available as a fun rainy day project, one version for kids and one "super-hi-fi version for geeks." The image on the right was captured by Gene Cernan or Harrison Schmitt, looking northeast from the Apollo 17 landing site in the Taurus-Littrow valley on the Moon. The image on the left was generated from photos and digital terrain models produced by the Terrain Camera on the Kaguya lunar orbiter. Although Kaguya cannot manage the small scale of detail on the rocks in the foreground of the Apollo 17 image, the similarity of the shape and texture of the distant hills is striking. On the surface of Mars, it is early winter in the southern hemisphere (Ls 102°). Today is sol 1,618-19 for Spirit and 1,597-98 for Opportunity. Spirit has now reached the halfway point of the panorama it is acquiring from its winter parking spot (see below). Opportunity is still wending its way toward Cape Verde. The MARCI team continues to report clear skies for Spirit, Opportunity, and Phoenix, and mild weather elsewhere on Mars, with only localized dust storm activity, in Solis Planum and northwest of Elysium Mons, and very pretty water ice clouds over the Tharsis Montes. As I write this, the clock is ticking over to sol 57 on Phoenix. There has evidently not yet been a delivery to TEGA since the doors of oven 0 were successfully opened on sol 53; as far as I can tell, they are still testing out the difficult process of grabbing an ice-rich sample and delivering it to TEGA all in one sol. They have also been doing some round-the-clock science activities, and coordinated observations with Mars Reconnaissance Orbiter, and struggling to come up with the right set of parameters to get the Atomic Force Microscope moving forward on analyzing samples. I'm working on getting an interview for a more detailed update later this week. Over at the Mars Odyssey THEMIS website, it's been another a week of "THEMIS As Art," images, in which the team highlights images that contain unusual, abstract textures. My favorite is this butterfly crater, which reminds me of the butterfly craters on Venus. There's more good stuff on the Mars Reconnaissance Orbiter HiRISE new release website than I can check out this week, so you'll have to browse those images for yourselves. As has been the trend for the last few weeks, there aren't a lot of close encounters planned for the Cassini mission, which continues its stable once-per-week orbits of Saturn; it just this morning passed periapsis (its closest approach) of Rev 77, crossing to the sunlit side of the rings. With the once-per-week orbits, periapsis happens on Mondays and apoapsis now on Fridays. JMKnapp's science planning page tells me there were some Dione observations yesterday, some Tethys stuff on Saturday, and otherwise it's rings, rings, rings, and fields and particles stuff. Last Monday they did have this amazing perspective on Saturn's south pole. 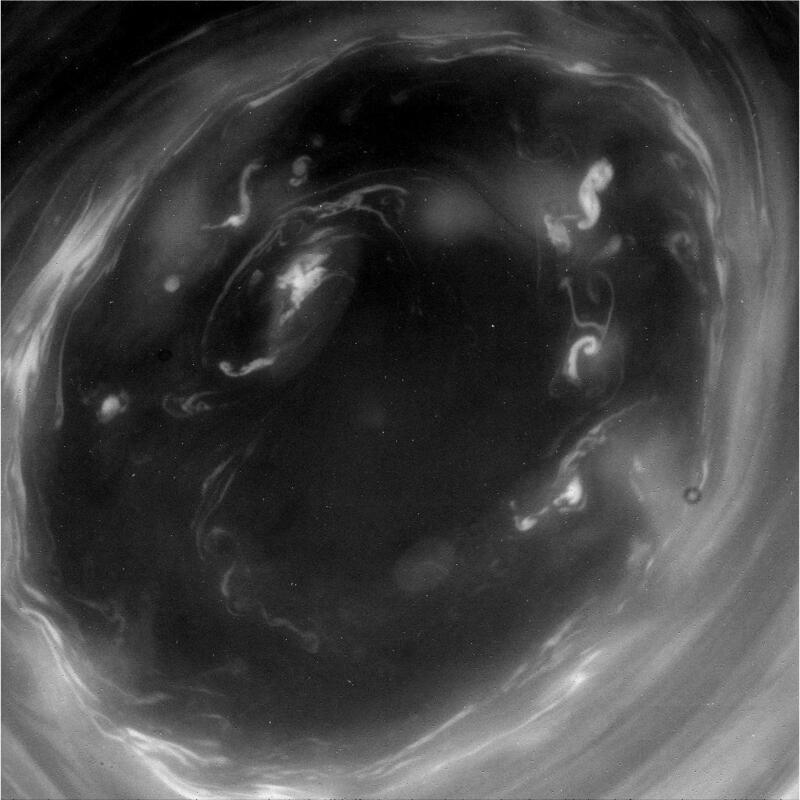 On July 14, 2008, Cassini stared up at the south pole of Saturn and captured many views of the center of its south polar vortex. Rounding up the rest of the spacecraft: MESSENGER is cruising toward its second encounter with Mercury on October 6, 75 days away. It is 178 million kilometers from Earth and 133 million kilometers from Mercury. Deep Impact is continuing its EPOCh observations of extrasolar planets. Rosetta is 45 days away from its September 5 encounter with asteroid (2867) Steins. New Horizons is 9.7 AU from Earth and 21.1 AU from Pluto. Voyager 1 and 2, Dawn, Hayabusa, and Stardust are all in cruise mode, talking to Earth from time to time; Genesis is in hibernation.